A delightful modern chalet in the centre of the Nasserein area of St. Anton with easy access to the slopes. Chalet Christophorus has an ideal location very close to the nursery slopes, with skiing almost to the door for good intermediate skiers (via a short off-piste section). 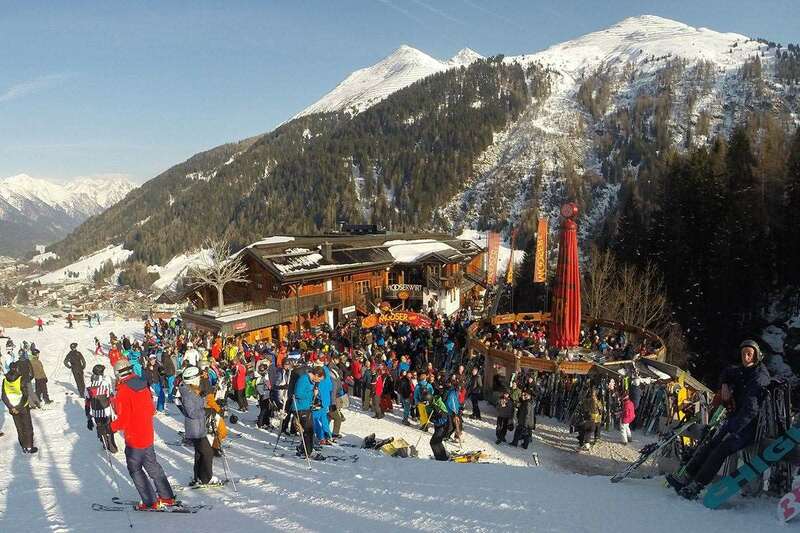 The après-ski bars and main Nasserein gondola are within 150m of the chalet and the ski bus into St. Anton village centre stops nearby. The communal areas are modern and stylish and the bedrooms prettily decorated. There is a sauna on the first floor to help soothe your muscles. Please note: Noise restrictions apply after 10pm. Rooms 2 & 3: Austrian twins* with shower/wc. Room 21: Austrian twin* with shower/wc. Room 22: Twin with shower/wc. Rooms 23 & 24: Twins with shower, wc & balcony. Room 25: Austrian twin* bath, wc and extra bed^ for child (up to 15yrs). ^ Available when whole chalet booked for exclusive use. *In certain locations, a twin is commonly accepted as referring to two separate mattresses and duvets contained in one large frame. Most hotels have rooms that will take an extra bed if required. These extra beds may be bunk beds, fold-away beds or sofa beds, but the suitability of these beds may depend on each individual. Where an extra bed is added this may limit the space available. Rooms with extra beds are still bookable for two person occupancy although, in this case, the hotelier may allocate a standard-sized twin bedded room without extra beds. Single rooms do not always match up either in size or facilities to twin bedded rooms, even when a supplement is paid. Food is a highlight of any ski holiday, and our Chalet Hosts will prepare and serve your meals as described here six days per week*. Start the day with a hearty hot and skiers’ breakfast to prepare you for the slopes, including a cooked breakfast with your choice of bacon, eggs, sausage and baked beans. Additionally, and normally set out for you buffet-style, there is a choice of porridge or cereals, tea, coffee, fruit juice, bread (including croissants in France), cold meats, cheeses and preserves. Afternoon tea is the traditional ‘welcome home’ for chalet guests at the end of a day’s skiing, with a slice of freshly baked cake, different each day, to accompany your choice of tea or coffee. Our 3 course dinner menus start with an glass of Prosecco followed by an appetiser, main course and dessert, accompanied by a choice of complimentary wines, squash, fruit juice and water with coffee or tea to follow. Vegetarian options are always available, and other special diets are available at a supplement if booked in advance. * On your Host’s one day off each week, they will leave a simpler continental breakfast out for you to help yourselves, there is no afternoon tea that day, and you can dine out locally in the evening. Your Resort Representative will gladly help out with information and make a reservation for you if you wish. We serve a separate High Tea at 5:30pm for children aged 11 years and under with an appropriate menu. Unless children are part of an ‘exclusive use’ whole-chalet booking in chalets, it is not possible for children aged 11 years and under to eat at the adult sitting. However, where children aged 11 years and under are part of an ‘exclusive use’ whole-chalet booking, parents may elect for their children to eat with them at the adult meal times on payment per child per week supplement. Great location, you can ski to the door if you take the right route from the piste down. Approx. 12 min walk to centre of town, several local bars very close by including Fang bar on the piste. Clean, modern rooms with satellite, great heated boot room. Chalet hosts Luke & Anna are the best, lots of quality food each evening, free wine & cakes in the afternoon. Our group of 17 were there on 16-23 Jan 2010 and had a great time, highly recommended.